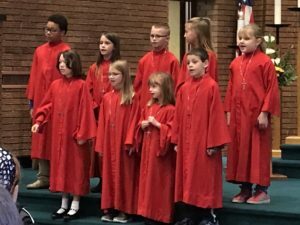 Joyous Juniors is a choir for children in Grades 1-6, and Connie Smeby is their director. Joyous Juniors practice on Sunday mornings before Sunday School at 10:45am. Weekly rehearsals include singing, fellowship, and learning about the church’s worship traditions and practices. Any questions, contact Connie on our staff page.